New feature: View companion statistics. Included new support patches for Crystal, Kat, Outcast Nitro, Sarah Lyons and Zen (Quo Vagis). Included a new support patch for Malibu (Quo Vagis). New optional setting for 'Avatars Visibility': Can now be set to be visible when in selection-mode or during combat. All support patches for non-vanilla companions are now included in the main download package. Bug-fixes and improvements, both to the mod and to several support-patches. Fixed an issue with the 'Move To and Stand Guard' command, often not working. Fixed an issue with key re-binding not working properly. This mod is designed to revolutionize the way companions are controlled and interacted with, bringing new elements of team-work and tactics, with the intention of making the game look and feel a little more like a proper role-playing game than like an action-shooter. 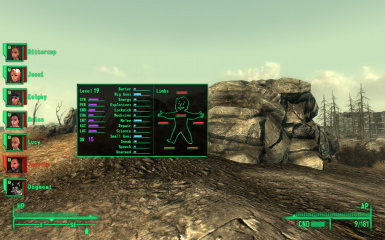 Using a command interface integrated in the HUD, companions can now be given a selection of different commands, all remotely, in real-time, without having to approach them and initiate dialogue. 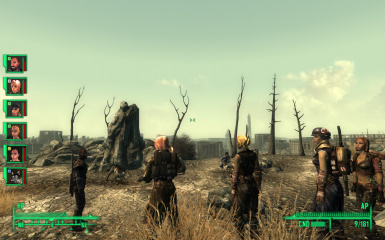 This is a Fallout 3 version of a mod of the same name I originally made for Fallout: New Vegas. Though some features were more challenging to implement, and demanded a more creative approach (mostly due to FOSE being much inferior in many areas to its successor, NVSE), the result is (almost) identical to the FNV version, both in features and functionality. 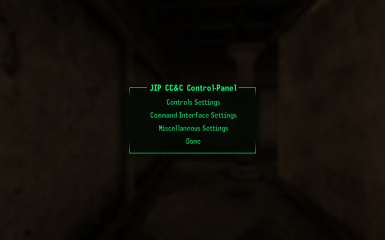 The most significant difference is that, unlike the FNV version, JIP CC&C for Fallout 3 does not include universal support for the majority of companion mods. To be able to use the CC&C system to control any non-vanilla companion, a patch is required. 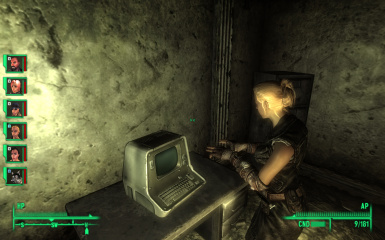 What was possible to work around in FNV is, unfortunately, not possible in Fallout 3, due to a number of problems/limitations. 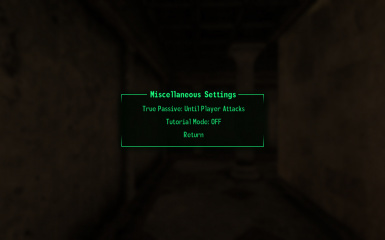 The mod includes built-in support for all vanilla companions, as well as optional support patches for most popular companion mods (see a complete list of supported companions, below). Mod authors who are interested in making a patch for their companions are welcome to contact me for guidelines. Be Passive/Aggressive - When set to Aggressive, the companion will observe normal combat behaviour (according to his various AI attributes); When set to passive, the companion will remain completely passive in combat and will never engage enemies (even if attacked directly). Passive mode can be configured (from the control panel) to two options: Remain passive always, or remain passive until the player attacks an enemy. Use a Stimpak - When given this command, and if he requires healing, a companion will use a Stimpak. 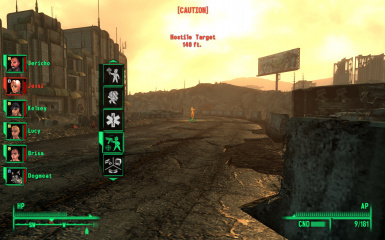 If the companion is within 10 feet of the player, the player's Medicine skill will be used to determine how much hit points/limb condition are restored (unless the companion has a higher skill). If the companion is farther than 10 feet, he will need to carry a Stimpak in his backpack. 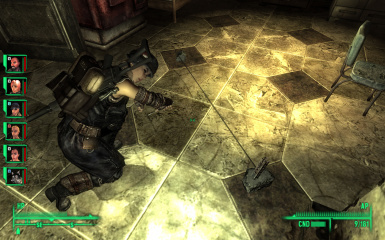 Note that non-human companions cannot heal themselves, and must therefore be very close to the player when using this option. Attack Target - The companion will concentrate his attacks on a single target (selected by the player), using either a melee or a ranged weapon, and staying hidden if the player is in sneak mode. Hack Terminal/Pick Lock/Disarm Trap - The companion will perform any of these actions on a target (selected by the player). Success chance is determined by a skill-check (based on the required skill and the companion's level) vs. task difficulty-level. Note that a companion is not required to be proficient in the relevant skill in order to make an attempt, but his success chance will be considerably lower. Loot/Pickpocket - The companion will either loot an item (of any type) or a container, or pickpocket a target NPC (in both cases, selected by the player). 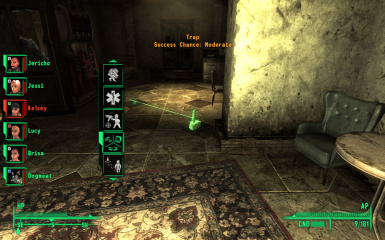 As with Hack/Pick/Disarm, success chance is based on the companion's skill (Sneak), and is also modulated by several other parameters (such as the environment and alertness of nearby NPCs). Looted items will be found in the companion's inventory. Aside from the obvious advantage of being able to utilize yet another companion skill, another advantage is that no karma loss is suffered when stealing/pickpocketing, provided the companion was able to complete the task without being detected. If caught, however, the usual negative effects will apply (though any stolen goods will not be confiscated). Move To and Stand Guard - The companion will move to where the crosshair is pointed at, and will remain there on guard, attacking any enemy who comes near, and staying hidden if the player is in sneak mode. 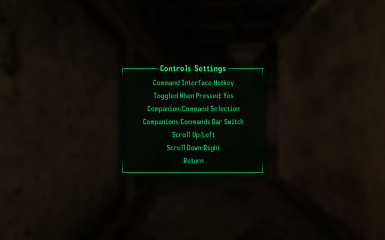 Every command (except for 'Open Inventory', 'Lockpick/Hack/Disarm', 'Loot/Pickpocket', and 'Start Conversation') can be given to all companions at once, by holding middle mouse button for one second. View companion statistics - Pressing right-SHIFT when in companion-selection mode will display/hide companion's statistics and attributes, including experience level, SPECIAL, skill level, damage resistance and limb condition. 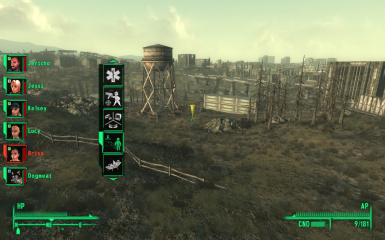 This is especially useful when using the Lockpick/Hack/Disarm or Loot/Pickpocket commands, as it enables you to select the companion who is most proficient in the required skill (and is therefore more likely to succeed). Can control up to twelve companions (if you have an entourage of more than twelve companions, only those twelve most recently hired will be managed - the rest ignored). 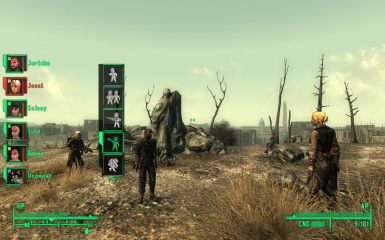 Note that this mod does not modify the maximum number of vanilla companions you can have at one time (which, by default, is one human and one non-human). Can display up to eight companion-avatars (due to limited screen area). You can select which companions are displayed. All the keys that are used for operating the command interface. Whether the interface is "toggled" when pressing the hotkey, or only remains up while holding the key down. 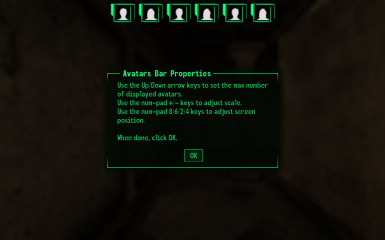 The visual appearance of the avatars bar, including the number of companion-avatars that are displayed on the HUD, the on-screen layout (left/right/top/bottom) and scale of the bar. 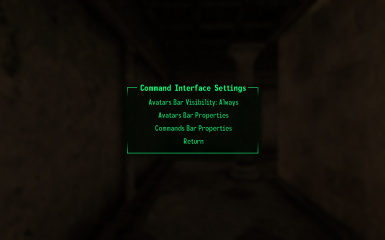 The visibility of the avatars bar (always/selection-mode or combat/selection-mode only). 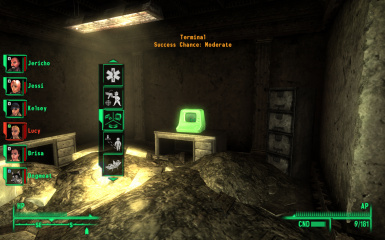 The on-screen position and scale of the command selection bar. Configure two shortcut hotkeys for giving express commands to all companions at once. All companions are automatically added managed - no need to equip them with a special "token" item and such. 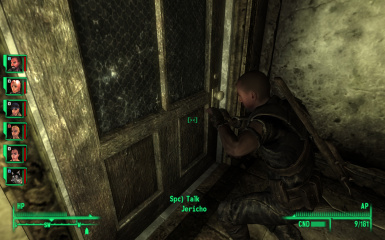 For the sake of realism, companions cannot be given commands when not in the same cell/worldspace the player is, or are not within a hundred yards of the player. 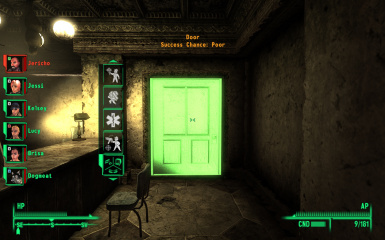 The Fallout Script Extender (FOSE), installed and loaded with the game. Mouse and keyboard (game controllers will not work without using some 3rd party software, such as Xpadder). It is also recommended that you install Unified HUD in order to make sure all your UI files are properly registered. 2. Locate 'jipccc_fo3_hud.exe' (in the 'Data' folder), run it, then press 'a'. 3. (Optional) If you are using one or more of the companion mods listed above, open the folder 'JIP CC&C Patches' (which will be found in the 'Data' folder after extracting the ZIP file), move all the patches you require into the 'Data' folder. 4. 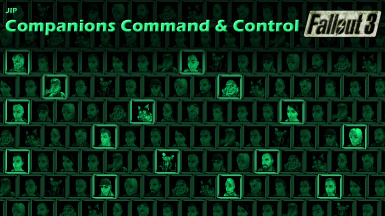 Lastly, open what mod manager you use and make sure “JIP Companions Command & Control.esp” and all the patches are ticked. If using any support patches, make sure they are loaded after their companion mods, and after JIP Companions Command & Control.esp.